Z-ULTRAT is a strong functional plastic filament suitable for 3D printing of many different types of durable objects. It is the perfect material for additive manufacturing of prototyping models. Realize features of products that are normally produced using injection molding technology. Z-ULTRAT is a strong functional plastic filament suitable for 3D printing of many different types of durable objects. Z-ULTRAT is optimized for processing on Zortrax M-Series 3D printers. It is the perfect material for prototyping models. Realize features of products that are normally manufactured using injection molding technology. It is also suitable for mechanical and chemical finishing. Objects 3D-printed with Z-ULTRAT are strong, stable and very durable. Z-ULTRAT properties are suitable for evaluating the object before mass production begins. This filament comes with a diameter of 1.75 mm. The processing of this material produces few unpleasant odors. This material has low elasticity and minimal deformation. Now use your Zortrax M200, M200 Plus or M300 to create beautiful architectural models and functional prototypes. Process Z-ULTRAT in a temperature range of 269 – 279° C. We recommend the use of an enclosed installation space. 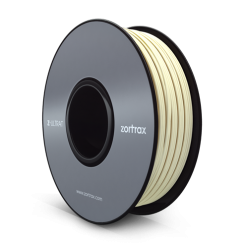 Buy Z-ULTRAT here and get a strong, durable and functional filament for the Zortrax M-Series (M200, M200 Plus, M300). 3D print with it parts that resemble injection molded parts.